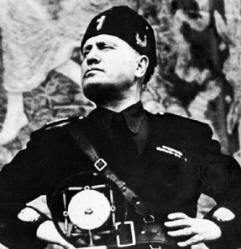 Mussolini said that Fascism should rightly be called Corporatism, as it is the merger of corporate and government power. Now that the Supreme Court has ruled in a 5-4 split decision that a corporation is a person, and that its political donations are free speech, we now have what Mussolini was talking about right here and now. Scalia, Thomas, Roberts, Alito and Kennedy are partisan hacks doing the bidding of the Republican Party and the corporations that own it, not the neutral jurists we were taught that they were supposed to be in school. They are unfit for the bench in any court, especially the highest court in the land. While they are at it, they should declare all laws against bribery unconstitutional. Since bribery is free speech when corporations bribe politicians, it should be alright for everyone. The right to free speech is something all people are supposed to share equally. Money is not speech. Comparing the two is not comparing apples to oranges, it is comparing apples to rocks. If money is speech, then only the richest one percent and huge corporations have a voice. The rest of us are mute. Besides, a corporation is a thing, not a person. If corporations can spend as much as they please on campaigns, then their chosen candidates will be the only ones we ever hear about. There will be no viable opposition. This obscene ruling has made some happy, like Kentucky Senator Mitch McConnell, who has been legalized bribery's best friend in Washington since his first day in office. I suspect he always knew deep down that he was full of it when he claimed that donating money is free speech, and is now laughing all the way to the bank to an even greater degree than before. What makes matters worse is that politicians like him are the rule, not the exception. Except for a handful, those in Washington do not view themselves as public servants, but as the ruling class. They view the rest of us as their subjects. The House and Senate are a parliament of whores turning tricks for their corporate johns through lobbyist pimps, and all of America is getting screwed. If nothing is done about this disaster, then democracy is dead. Elections will be professional wrestling; a staged show with pre-determined results that only looks like a competition. Low voter turnout may be because a lot of people already think elections are fake. If those in Washington take offense at what I have written here, let them prove me wrong. Abolish the notion of corporate personhood. Perhaps no law limiting corporations will ever stand up to the courts they own, and we should abolish corporations entirely through a constitutional amendment. If all businesses were proprietorships and partnerships, there would be no corporate veil for the corrupt to hide behind. They could be held responsible for their individual misdeeds as individuals. I would be all for that.